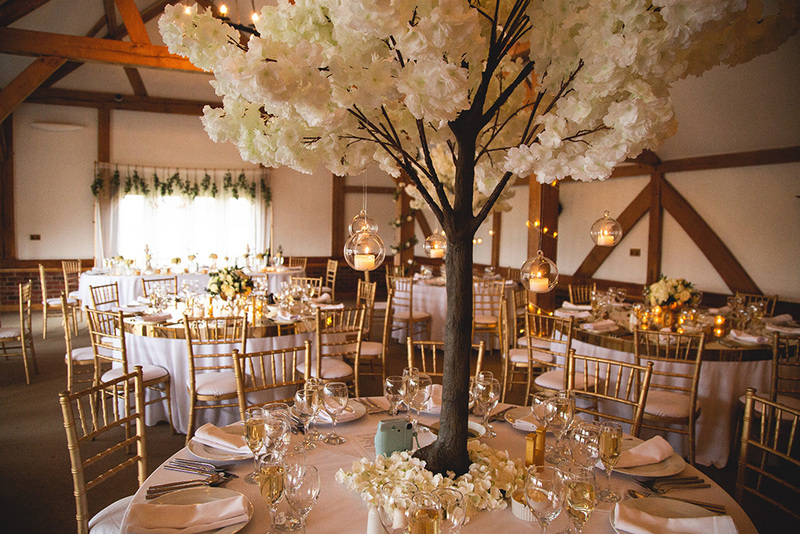 Of course, setting a scene is all about choosing the perfect venue. 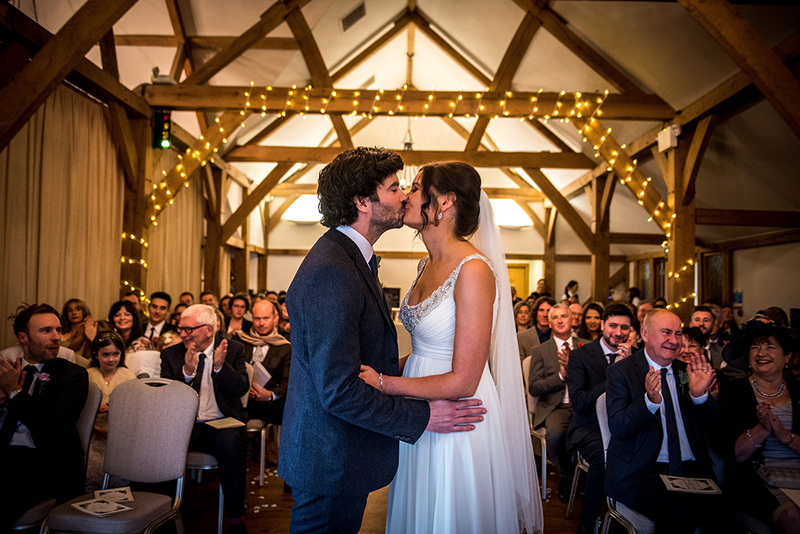 If you’re planning an autumn wedding and looking for rustic wedding ideas, a barn is the perfect choice. 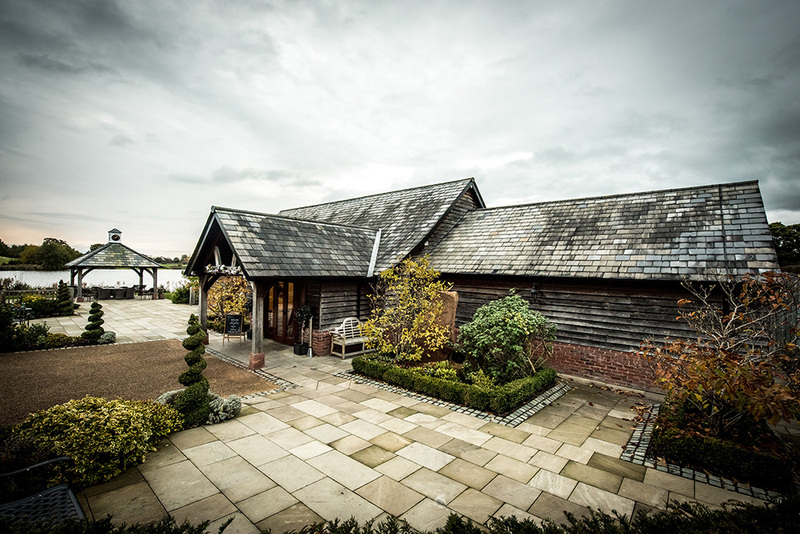 Built to a traditional design, the magnificent Oak Barn at Sandhole is the ideal backdrop. 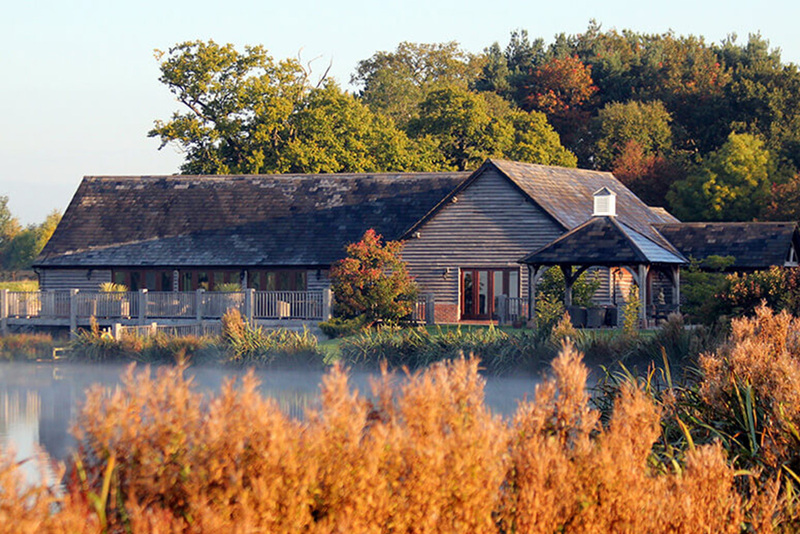 With views over the rolling countryside and the beautiful lake, at Sandhole Oak Barn you will certainly be able to appreciate the beautiful colours of autumn. Add that rustic touch by bringing the outside in, echoing the beauty of nature with seasonal flowers and foliage. Embrace the natural look by keeping arrangements loose and informal and using raffia, hessian or twine instead of lavish ribbons. 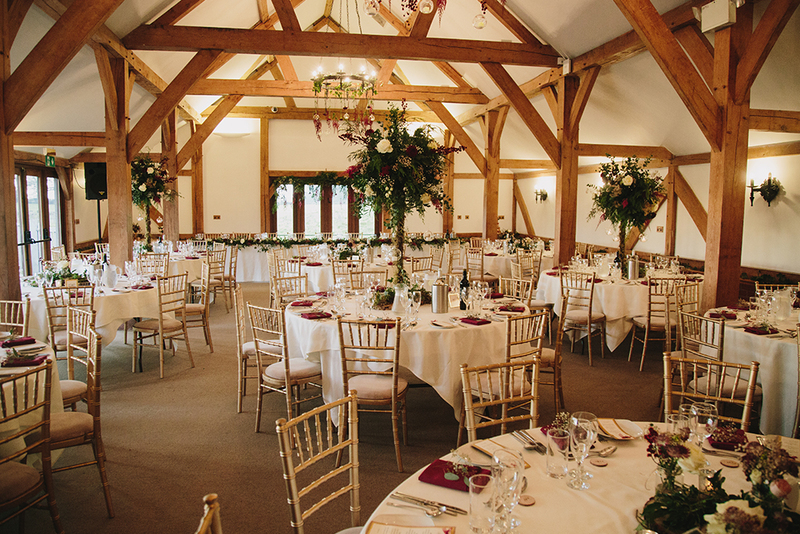 When it comes to barn wedding ideas, with the Oak Barn offering the perfect canvas, you need to add just a few simple touches to impart your rustic theme. 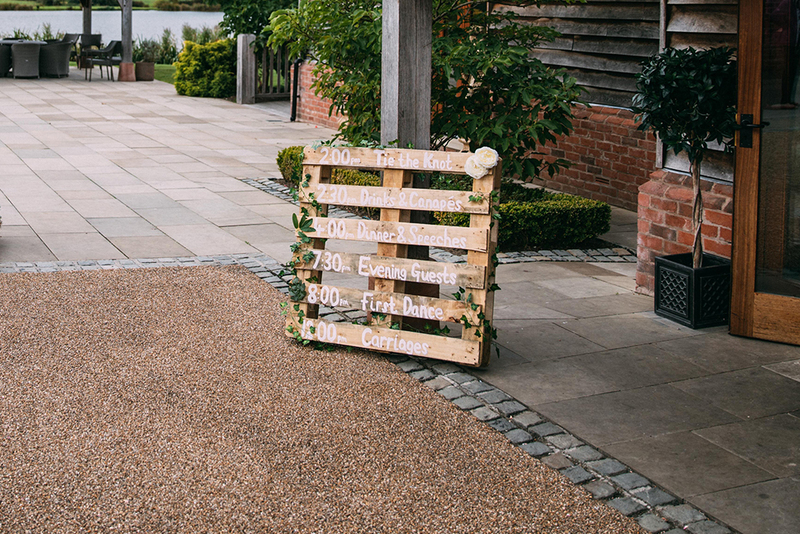 Choose natural colours and fabrics, and introduce a few rustic ‘props’. You might, for example, use a blackboard for your seating plan or wooden pallets to make pretty signs. Swap traditional vases for an assortment of jam jars, mason jars or glass milk bottles and keep the look personal, handwriting your place cards and incorporating details like family photographs to your decorations. 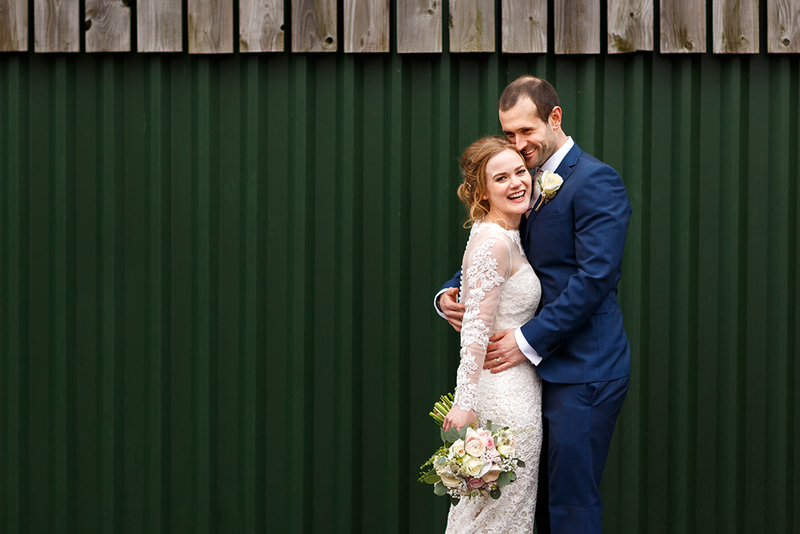 For this rustic style of wedding, it’s important that your dress suits the scene. Choose a boho style of gown – softly elegant with graceful lines and romantic details. When you’ve found the perfect dress, choose a similar style for your bridesmaids and complete the look with floral hair crowns and trailing bouquets. 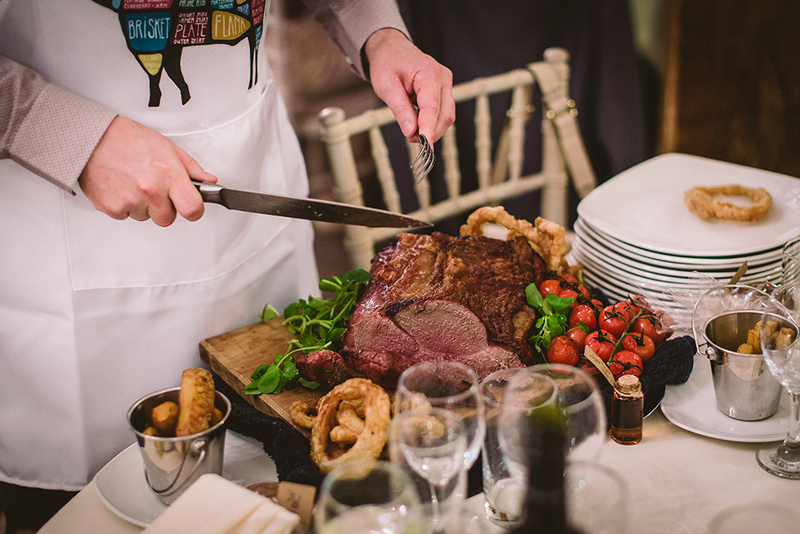 With the informality of a rustic wedding, an equally relaxed menu is the most appropriate. 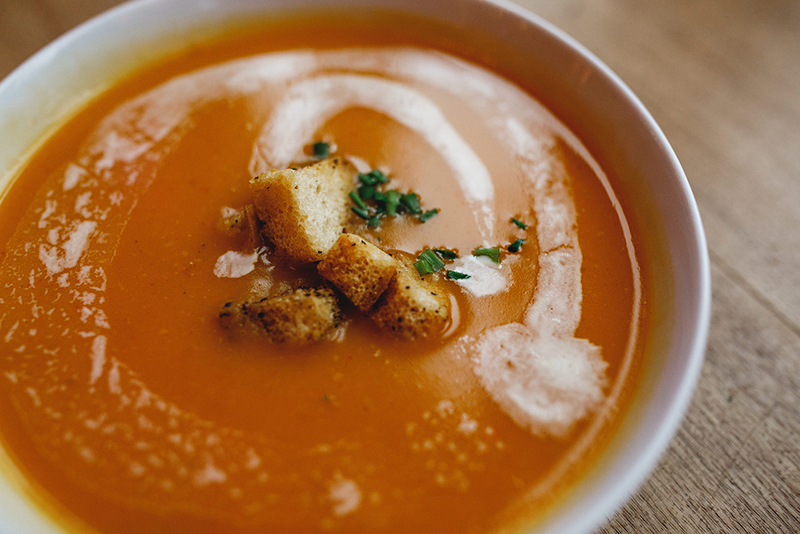 Chat to your caterer about using wonderful seasonal produce which will work in harmony with your theme. 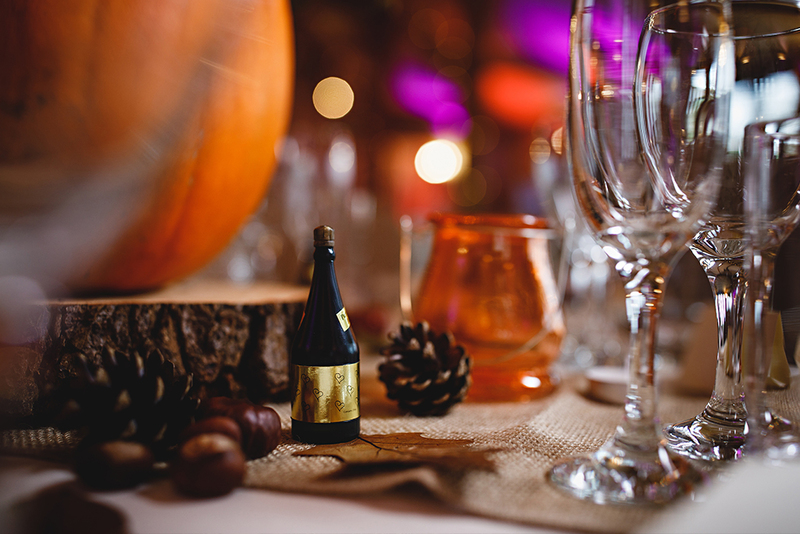 You might even decide to serve an alternative drink such as Winter Pimm’s– something warming and delicious! Finally, it’s often the smaller details that make all the difference. 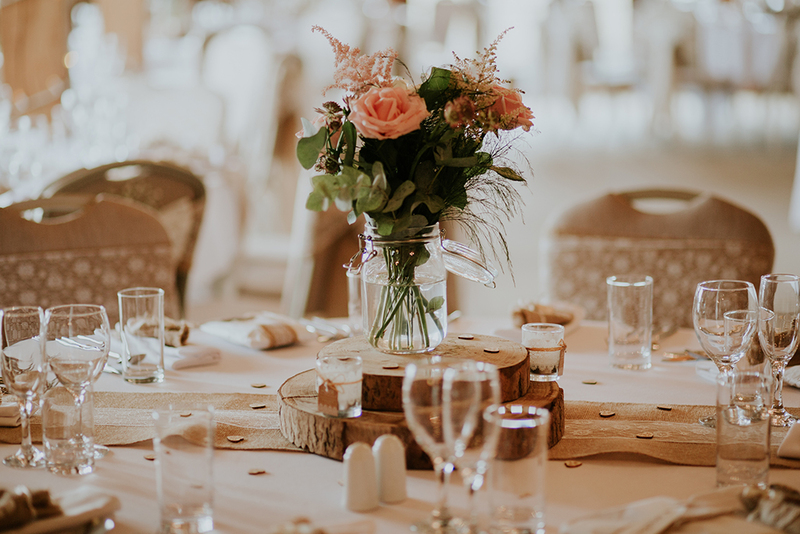 Rustic wedding favours might include hessian bags filled with flower seeds, toffee apples or home made jars of honey or jam. Stationery should be elegant but simple, perhaps on a Kraft paper background. And, of course, it’s important to include a dreamy wedding cake. The semi-naked cake fits a rustic theme beautifully, particularly when adorned with delicious berries and blooms. 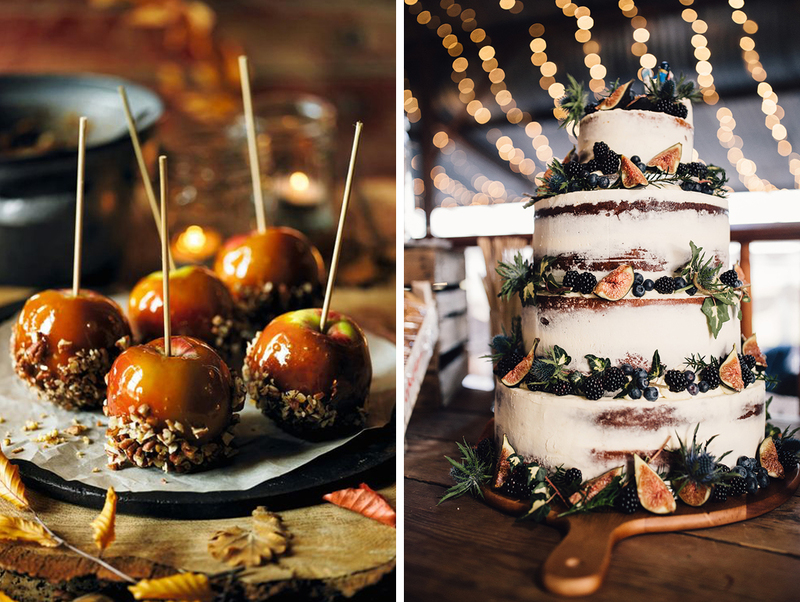 If you’re planning a barn wedding and considering an autumn wedding theme, we would love to show you all we have to offer. 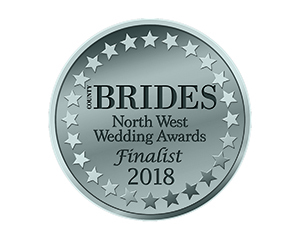 Call our friendly wedding team on 01260 540007/224215 to discuss your plans or perhaps arrange a visit. 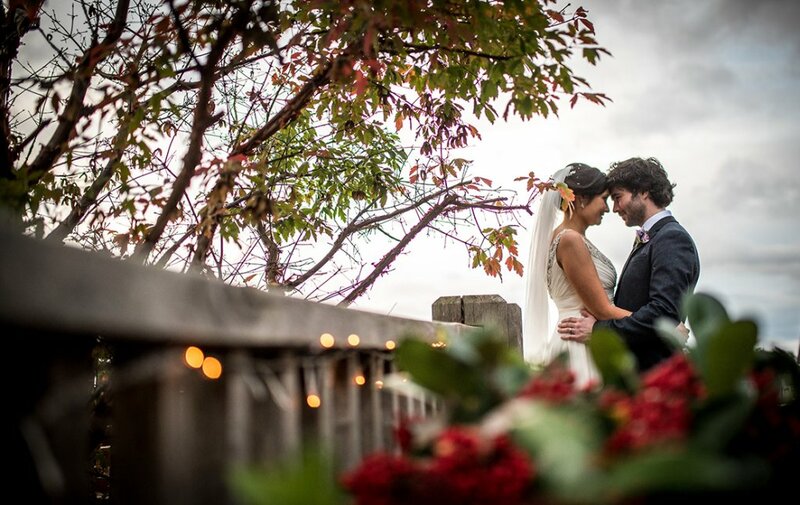 In the meantime, we hope you’ll be inspired by other autumn weddings here at Sandhole Oak Barn.